Courtesy of jolesch photography. Their pictures are way too expensive! Runners high. Eleven and 3:16. Two words and two numbers. The summations of my race. Runners high, even that seems not to capture the feeling of this race for me. Saturday night after 26.53 miles(over a third of a mile long on the course according to my Garmin) I was ready for a speed workout on Monday. Holding my Moose Trophy. Of course none of this is possible without my number one fan. Nerves were racing high. I felt quite a calm throughout the day compared to the edginess of the previous week. I pounded my chia seeds, fish oils, oatmeal, and greens. By evening I was tense. We got up to my parents at about 4 pm. The kids were geared up for a "sleep over" since Marie and her family were staying with us. At 8:30 we had the kids down and Brent, Peter, Marie and I headed over to the Expo and to pick up our numbers. I had a bone to pick with the pacers, who were pacing times faster than their PR's. I chose not to run with them. The weather turned ominous at about 10 pm. With my flash light app, I just kept going over possible pacing strategies. Ultimately I decided, I wanted to finish strong. I would come down the canyon at 7:15 pace, and finish the second half with around a 7:25 pace, not too big of a spread. All recommendations are to start this course fast because of the downhill in the beginning. However, I knew I didn't want to run 10 minutes miles the end of my race. I was asleep by 11pm. Thunder and a beating rain at 2:30 am woke me. I listened on and off for the next 2 hours as it never let up, praying it would at least stay warm. Please no snow! My alarm went off at 4:50 am, not too bad of a wake up time. I was mostly awake as it was. Brent drove us to the busses. At 5:20 we hopped on board. Marie and I both confessed considering mascara but opting out because of the rain. Oh the vanity. It was raining softly on the bus, not too much to be concerned about. We were pleasantly surprised when we stepped out and it seemed quite warm. We spent the obligatory 30 minutes in line for our moments in the port-a-pottie. At 10 minutes out we stripped down and threw our bags in the bus. As if on cue, the heavens opened in a torrential downpour. We hid out like human sardines in the tent for a few minutes, and then ventured to the starting line. The rain had lightened a bit. I kept probing runners, searching for a fellow 3:15'er. No luck. Muskets fired and we were off. My luck changed in only the first mile. I heard three women about 10 feet ahead of me discussing pacing strategies. I surged up to join them, introduced myself and so we formed a group of four trying to bank a 3:15. My PR was the slowest of the group, but I didn't feel intimidated. We all happened to be in different age groups which relieved a bit of the competitive edge. Heather, as seen in the picture below, turned out to be my most faithful companion. Of all things, she is a cross country coach. She has that wonderful running dynamic like Marie. Positive, fun and very experienced. This was her 19th marathon, and I think her eighth time running this particular course. Nothing beats a great running partner in a marathon. Heather was 100% positive. I never would have the same race without her. We braved the rain and even hail as we cruised down the canyon. Within a few miles it was clear our pace was going to be around 7:20. However, I made a decision, I would slow for the companionship. Running a marathon alone was unpleasant and brutally long. Ogden sealed that in my memory. I felt like I was on a great training run. We had fun conversation and I rarely even thought about the miles as they just flew past. Passing the half-way mark, we were soaked through, but buoyant nonetheless. It was fabulous to see Brent, the children and my mom braving the elements to cheer me on at the mouth of the canyon. At this point in the race the course flattens out with several hills. Our effort picked up, and we tried to pump up all the hills. At mile 21 an awesome spectator informed us we were 16, 17, 18, and 19th of the women. Heather and I looked at each other and decided we would finish top 15. During these miles I started to feel the same pain in my feet which crippled me in the Ogden Marathon. Instead of panicking I decided to use my breath and take care of it. Utilizing my yoga skills, I sent every ounce of breath towards those feet. Willing the pain to go away. Guess what? Every time it did. Around mile 18 two of our group had dropped behind. I loved this portion of the course as we ran almost within eye site of my parents ranch. I knew all the turns, the elevation changes...we even ran by the scene of my dog attack 4 years ago! Saw the family again. Awesome boost. Heather began to fall behind at mile 22. I kept encouraging her to pull back up. Four different times she did, but then she didn't. It was up to me to bring in the last 3 1/2 miles. We had caught several women by this time and loads of men. I was feeling great. Still no pain to speak of. The weather really became a non-issue the last 10 miles. We had thunder, but no wind, freezing temperatures, or significant cloud bursts. I was very wet and heavy, but it didn't hamper my spirits. Here the course hits a significant hill. I powered up and still felt strong. I continued to pass runners. In fact, I wasn't passed the entire race after the first 2 miles. On a flat I started hearing some awful moaning. Loud, horrible groans. I was approaching a man in his late forties, who appeared to be in solid physical condition. He was accompanied by a partner. This man's eyes were closed and his face was contorted in what appeared to be excruciating pain. Based on his vocalizations, I think it was pretty bad. I tried offering words of encouragement and tips to relax and breathe. I don't think he was coherent to much. One thing I knew. Get out of earshot fast! It is not good mentally to be around that kind of moaning. I pushed past him. Another significant pass was the 3:10 pacer. 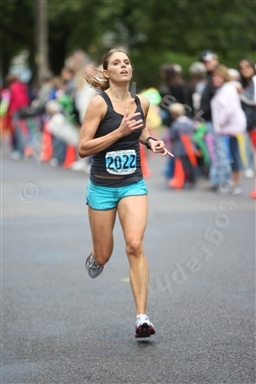 This was probably my low point of the race. I gave a snide comment to him. "You are lame. People were depending on you!" In retrospect I probably should have refrained. However, they were so over confident the night before as I drilled them. They guaranteed a 3:10 finish which would have been a PR for the guy. I should have cut him some slack, they weren't professional pacers. At mile 24 fatigue began to set in. Now it was time to push myself. I decided to ignore my lower body completely and just let my arms bring me in the last 2 1/2 miles. I pumped as hard as could. There were two women I could see and I knew I wanted to catch them. The hill at 24 I caught the first. Last woman to reel in was of all people, the Swiss woman from the bus. I gave it everything I had and passed her with a mile to go. When my watched clocked 26.2 miles it stung knowing I still had 2 more straightaways to go. However, at the half, it was clear the race would be long, so I was mentally prepared. The last 1/3 of a mile I sprinted as fast as I could. My vision blurred a little. All I thought about were my arms. On the homestretch I even won a footrace with the man next to me. (The evidence is on the video at the start. I look painfully slow but I was cooking for just having gone 26.53 miles!) I finished with a 3:16:49. .53- 7:08 I kicked it in strong the last 1/2 mile! Eleventh place overall for the women and an 11 minute personal record. I was 104th overall in over 1850 runners. My time was a minute slower than my goal, but it was a triumphant race for me. 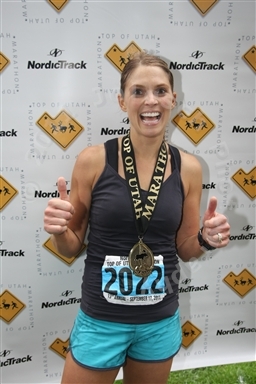 I am confident all the time I spent analyzing this race, my goals, what I wanted...it all paid off for me. I ran a smart, strong race, passing 8 women in the last 11 miles and over 35 women after the half mark. I still have the runners high, and I apologize if it sounds like I am tooting my own horn here. because she was first not second! Your breath can heal, distract or somehow erase the pain. Thanks to yoga for that gem which saved me! Incremental success can be more fulfilling and motivating than a wild shot at glory! 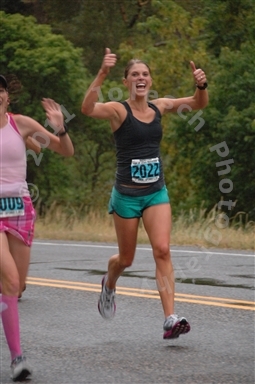 I chose to have an enjoyable race early on, knowing I would probably fall short of my 3:15 goal. But the reevaluation was the right choice in hind sight. An 11 minute PR is a wonderful stepping stone. Next year, I will try to break 3:10! Both lessons have worthy application in myriad circumstances. Best of all, Marie and I took first and second place in the 30-34 year old women. We were so excited, because initially the results said second and third. We had time to shower and come back at 1:15 for the awards ceremony. In fact we were running there as we heard our names being called out! 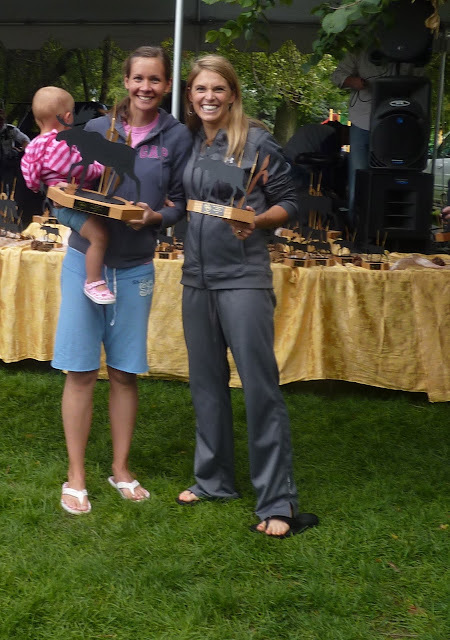 First and Second Place for Females 30-34, the fastest age category. Neighbors, friends, and running partners to top it all off! Despite everything I said previously, I decided to register for Boston. I'm not sure if I will run it or not, but I wanted to leave the door open. If there are still some spots left, I think I will get in. This marathon was invigorating and I am convinced I am just tapping into my potential. Train harder, longer, and faster and who knows what the future holds! Check the box for a job well done. Congratulations!!! Gives me chills to read about it all. I'm so glad you had such a fabulous experience! AMAZING! AMAZING! Rock star, I am so proud of you! I love this post! My mom and sister's have encouraged me to read it because I'm running the Halloween Half on the 29th and kind of psych myself out when it comes to races. My bowels go crazy and I worry more about what to eat or not eat, more than how my legs will feel during the run. I did my first half a year ago... this is number 2. Girlfriend, you are FAST! I'm exhausted just thinking of you maintaining less than an 8 min mile the ENTIRE marathon. GEEZO. I'm not that fast. I loved your play by play! You're inspiring.